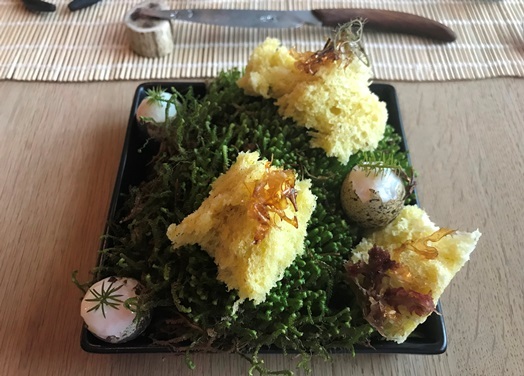 Stefan Wiesner is also called ‘the witcher’ and after having had the pleasure to taste his “Tasting Menu Soil (vegetarian)” (CHF 195.00) which costs the same as the meat version. The place is super simple, so no need to dress up. Come here the way you feel comfortable. Stefan is passionate about his food and the whole menu is served in a timely manner which also means you shouldn’t be late. The decor is simple yet appealing. 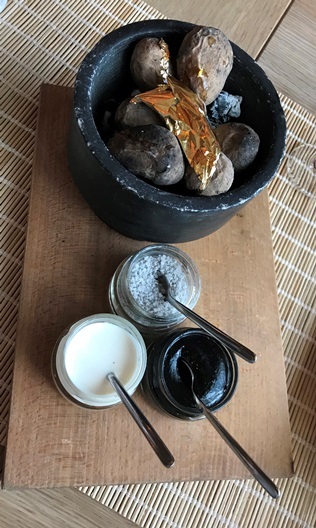 The menu starts with the course called “Apéro (potatoes from Entlebuch, boiled on beechwood coal from the charburner Doris Wicki, gold foil 22 carat, served on hot beechwood coal, charcoal mustard with charcoal distillate, alpine salt with beechwood ash)”. 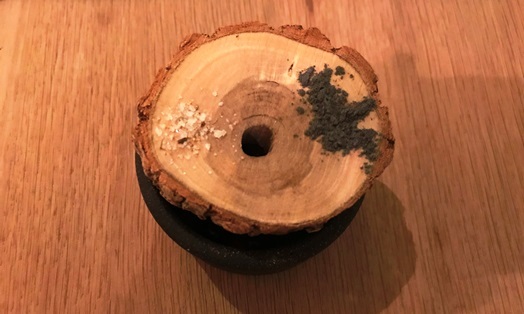 The spreads and the salt have this slightly wooden flavor and the charcoal mustard is actually surprisingly delicious. The “champagne glass with amber syrup, served with a berg crystal” (CHF 10.80) was quite interesting in terms of taste and fit very well with the “bread made with rye flour and kale”. 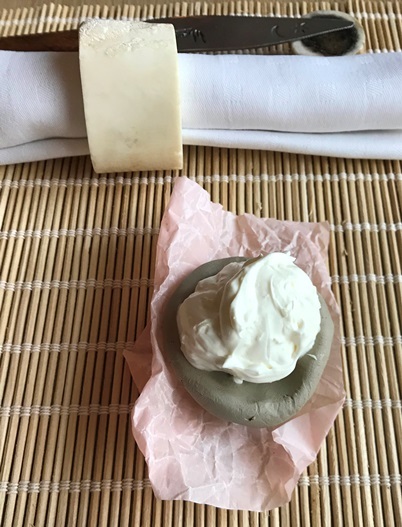 The “Butter (butter from Mount Napf with horseradish, served on fresh clay)” was smooth and rich and went perfectly with the bread. 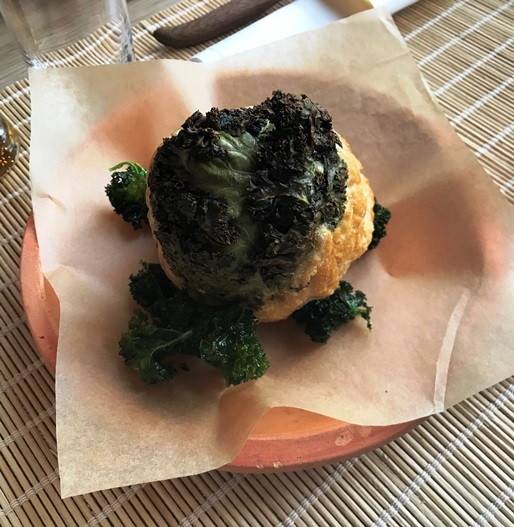 The next course was among my favourite ones – “Monotype (parsley root prepared in fire, parsley root puréed, parsley root steamed with parsley stock, baked parsley root shell, flat parsley pesto, roasted parsley seeds, parsley seed oil, parsley pomace seeds and parsley sprouts)”. 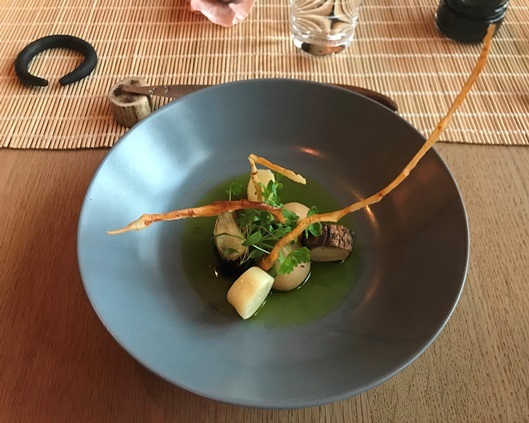 The whole dish was nothing but parsley in its different states and forms and flavors. It was impressive to see and taste how many different flavours you could extract from one single ingredient. The whole menu is well thought through and usually contains meat elements. Now given I was still stuck to eating vegetarian, I didn’t get the meat version but something else and frankly, it was somehow not that great. 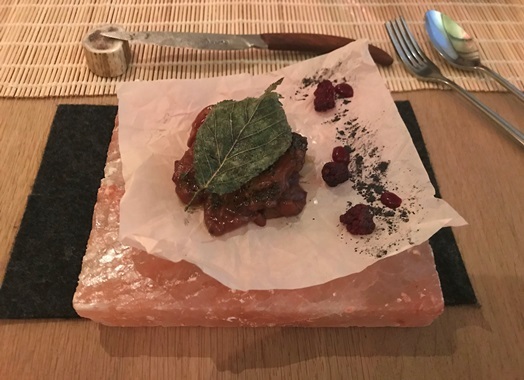 The “Fluxus (mortadella made from risotto (Terreni Valle Maggia), radish cubes, blossom honey, seasoned with nutmeg, cilantro seeds, white and black pepper and orange zests, served with turf bread crumble, bog pine needles, pine nuts, turf, blossom honey and whiskey sauce)”. While the whole ‘decor part’ was interesting and had a good soil taste, the mortadella with rice was incredibly insipid in taste. Luckily, things caught up a bit on the vegetarian menu side too. The “gnomes (mushrooms, pickled and braised in red wine, served with a chocolate sauce, ceps and thyme, blackberry sauce, dried blackberries, fermented blackberry leaves sauce, baked blackberry leaf, venison horn salt, blackberry distillate and blackberry ashes)” was heavy on the mushroom side but I loved for example the baked blackberry leaf and the ceps were flavourful as well. The following course was called “Tomatoes (brae burn tomato, stuffed with Swiss truffle, baked hazelnuts and apple seeds, basted with truffle oil, plated with raw apple, marinated with cloves and cinnamon, covered with strudel dough, smoked with apple wood, topped with milk jam, roasted hazelnuts, dried apple, chanterlles, soaked in sour must and lavendar seeds, accompanied by apple seed salt)”. It was not easy to eat as your plate was very tiny and things would just fall off. “Root to Leaf” was the equivalent to “Nose to Tail” but was somehow lacking the ‘playfulness of different flavours’. It was somehow rather monotonous and not in a pleasant way as previously with the parsley. 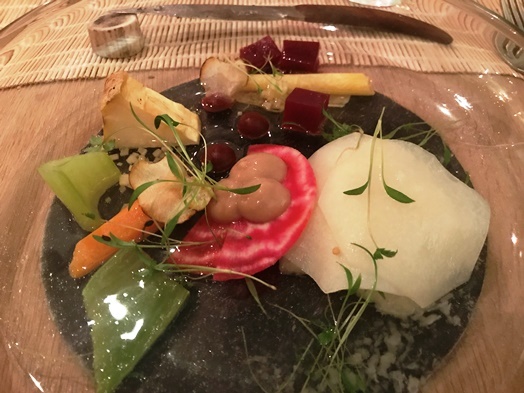 However, the “Root to leaf” consisted of “pulled kohlrabi, kohlrabi jus, kohlrabi carpacci, kohlrabi chocolate cream with hay hrebs, parsnip à la julienne soaked in apple vinegar, fermented yellow carrot, baked beet root, raw chioaggia root, braised celeriac, fried Jerusalem artichoke, puréed violet carrots, cooked carrot, glazed celery, young lovage)”. The best part of it – for me – was the stock. 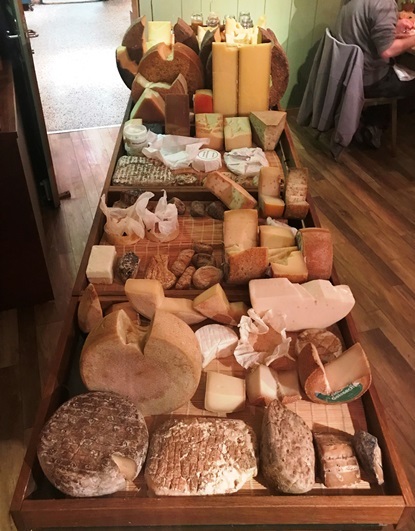 My absolute highlight of the evening was the “cheese wagon” where Stefan assembled everyone around the cheese wagon and explained the approximately 80 different types of cheese. Some rather standard, some quite extraordinary. You would be allowed to enjoy as many cheeses as you want for a flat CHF 18.90 which is an absolute bargain. 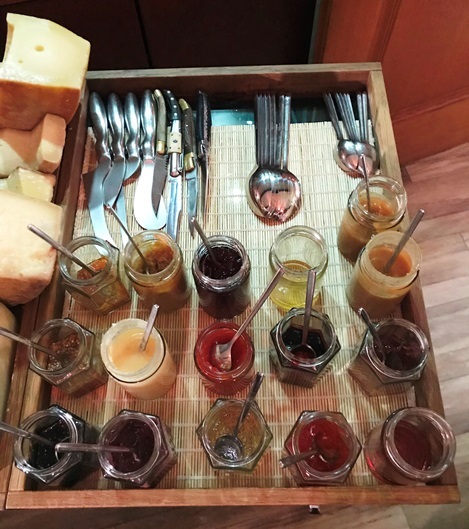 The same was true for the “spreads, respectively jams and chutneys”. You have a selection of 16 different options which makes it quite tricky to chose. Some bread is also served which is gossamer and tasty. 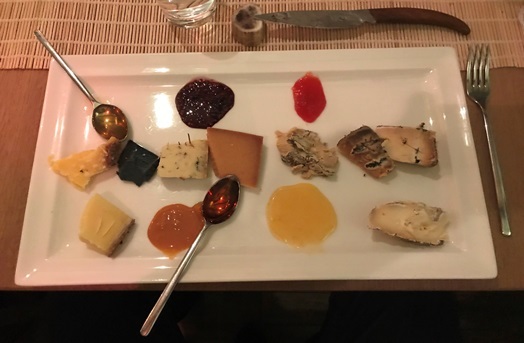 My cheese plate finally looked like this once I had picked all the interesting blue cheeses (cow, goat, sheep) as well as the coal cheese and some other specialties. And I liked it a lot. However, the ‘extant’ ones are not as intense as announced. 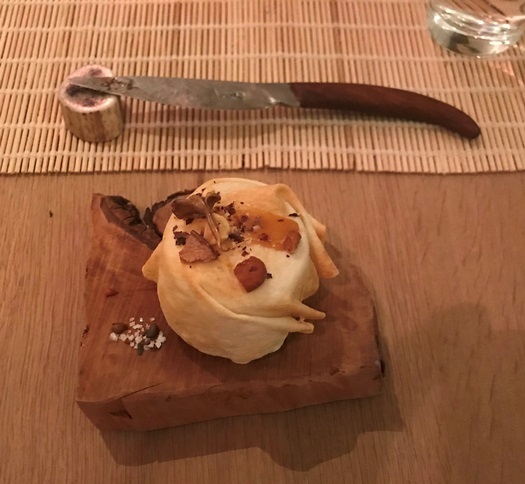 My favourite dessert was definitely “Spagyric (cream flan seasoned with piment, dabbed with black elder pulp, black elder pulp, leaf pulp and elder distillate, served with an elder alpine salt and elder wood ashes)”. It was a fruity mix of creamy consistency. Absolutely lovely! One of the most interesting courses was the last one. “Joseph Beuys (accompanied by stone essence on your skin)”. 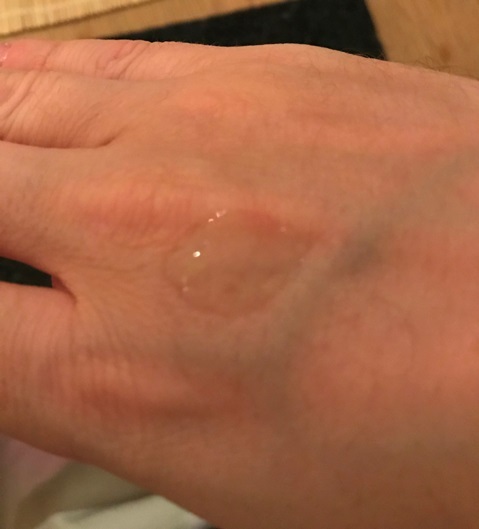 So basically I got a drop of water on my hand. Only, the drop of water tasted a lot more like stones. I am not making this up, it literally tasted like stones! 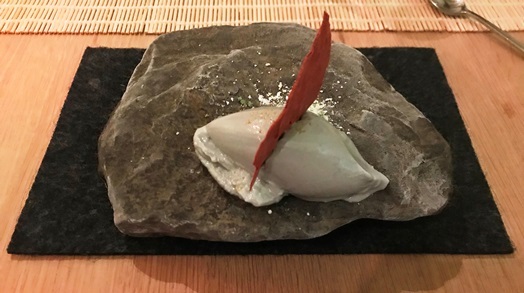 The dessert wasn’t just the drop of water tasting like stone but there was actually more to it: “ice cream made from schist from Allgäu (Albula tunneling), refined with salt mad of clay from Bolus, fizzy made of marble, crumble from Nagelfluh, chips made from ore”. It reads like a joke, I know, but it actually all tasted like stone. Very interesting! Last but not least, the friandises finished off the evening. 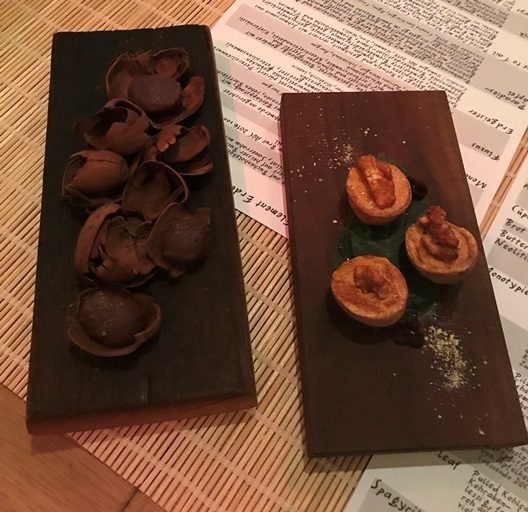 The “Thor, son of earth (acorn chocolate with acorn flour and wine hydrolat, dipped in Bolivian wild chocolate)” and “Wiesner, the stubborn buck (walnut gianduja filled with walnut shell, coated with roasted walnut, strewn with walnut shell powder, accompanied by walnut oil, nocino, walnut pomace and walnut salad)” were both tasty but the Thor was definitely my favourite. 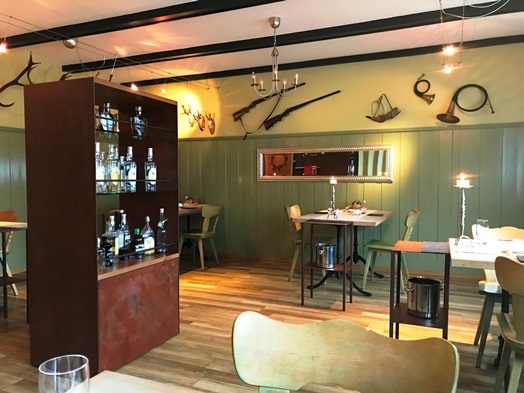 All in all, it is an experience going to the Restaurant Rössli and experiencing Stefan Wiesner, The Witcher, in person and enjoying his creations. 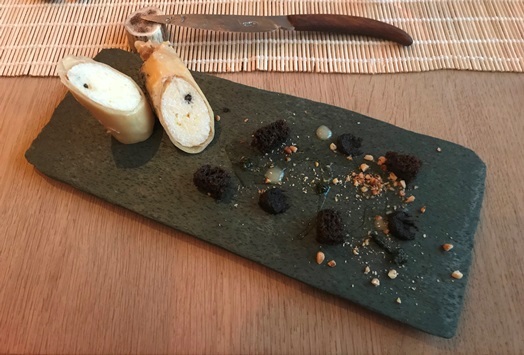 However, in the vegetarian option, I did not experience any oral orgasms or taste-gasms but admittedly, it is interesting to try something like schist ice cream or charcoal cheese. The service was generally exquisite as they really made sure your ‘special wishes’ are taken care of. But, you can see who is there for longer and who isn’t. There was one waitress which seemed to be pretty new to the game and she was obviously taught to top up the water and make sure that the glass never empties (1l water, CHF 9.80) and she really made sure. Now, this meant when you would have had one sip of water, there was someone there to top up your water. I mean, that’s all lovely and nice but she was overdoing it. However, it is worth trying and once my gout has passed, I will definitely go and try it again – in a meat version! Make sure to book a table well in advance as he is often sold out quite a lot in advance!